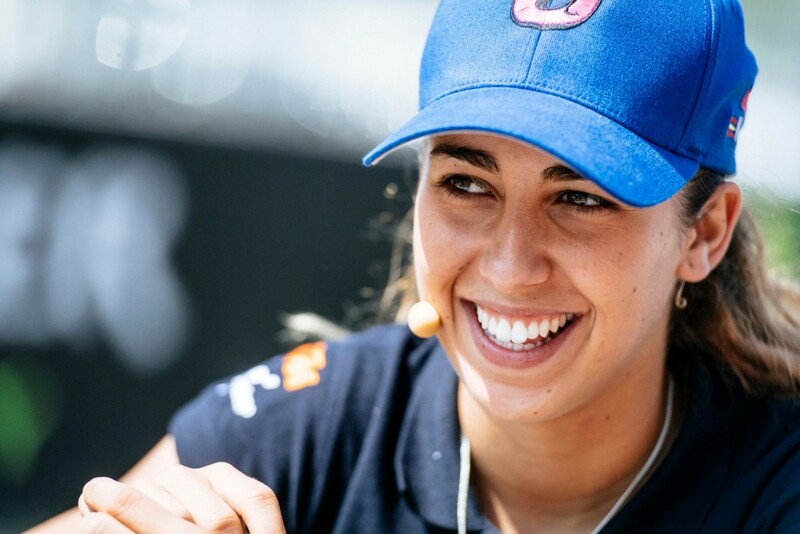 As the only woman in the Moto3 world championship, KTM’s Spanish rider Maria Herrera faces great adversity in her second season. Women have never had an easy time in the motorcycle world championship, as history has shown time and again. Antonio Herrera is proud of his daughter. Very proud. He takes his smartphone out of his pocket and swipes over the display. “There you are, look at that!” The picture shows Maria right at the top of the winners’ podium. Standing to her right is Fabio Quartararo, whom she beat into second place. Herrera senior carries on swiping. “And here!” Again, Maria is the winner, but this time it’s Jorge Navarro standing despondently next to her. These pictures were all taken at the Spanish CEV Championships from 2013 and 2014 as Maria regularly left the boys in her dust on her way to victory after victory. Unfortunately times have changed. 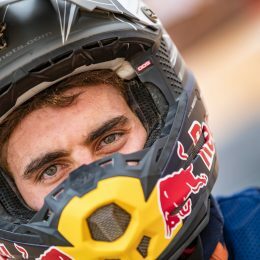 Jorge Navarro recently won the Barcelona Grand Prix, while Herrera has managed just two championship points so far in the 2016 Moto3 season – albeit with extenuating circumstances. We’re sitting in the team transporter’s trailer. Next to Maria and Antonio is Maria’s Crew Chief and our translator for the day, Sergio Martínez. Father and daughter have been through a few turbulent months, which seems to have taken its toll on Herrera senior in particular. To cut a long story short, the Herreras split from the already financially ailing LaGlisse team right at the worst possible time, just after the fourth race of the season in Jerez. 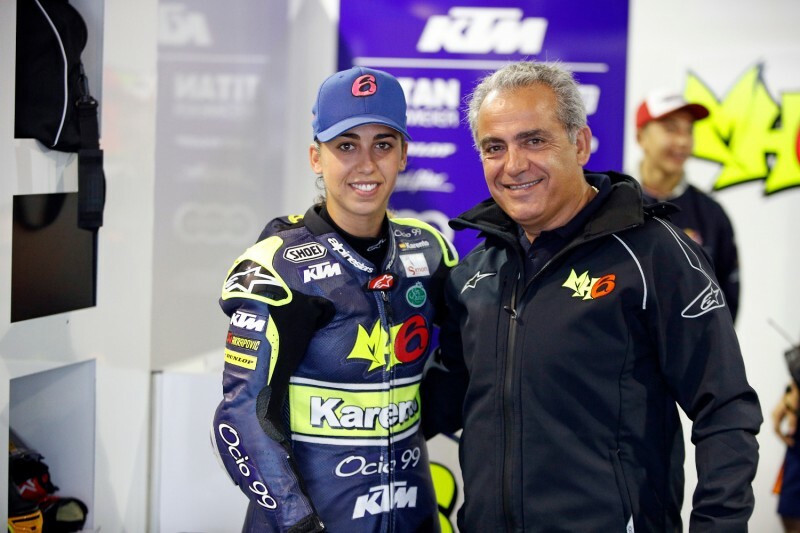 Papa Herrera was quick to take action: A successful businessman, he bought up the team, rebranded it with Maria’s initials and startnumber (MH6) and thus ensured Maria’s second Moto3 world championship season. “Maria is a natural,” says KTM MotoGP test rider Alex Hofmann, who often watches the lightning-quick lady from the central Spanish province of Toledo from his vantage point at the edge of the track. With her extreme hanging-off riding style, Hofmann believes that Maria has everything she needs to be a front-runner in the Moto3 world championship. But at the moment, she’s not. Her troubles are not altogether surprising when you consider that the newly formed team needs time to settle and that Maria missed some valuable testing days before the start of the season. This in particular has made life difficult for Crew Chief Sergio as he strives to find the right setup for the KTM. Away from the track, dad’s financial resources are of course not limitless; savings have to be made. There is nothing that the Herreras need more urgently then sponsors, but when Antonio came calling in the spring, he found that their budgets for 2016 had long since been allocated. “It’s very, very difficult,” admits Herrera senior on his efforts to drum up money at this stage of the season. Yet this father and daughter team can count a few famous supporters on their side. At the team presentation in early May, the two-time MotoGP world champion Marc Márquez decided to drop by. 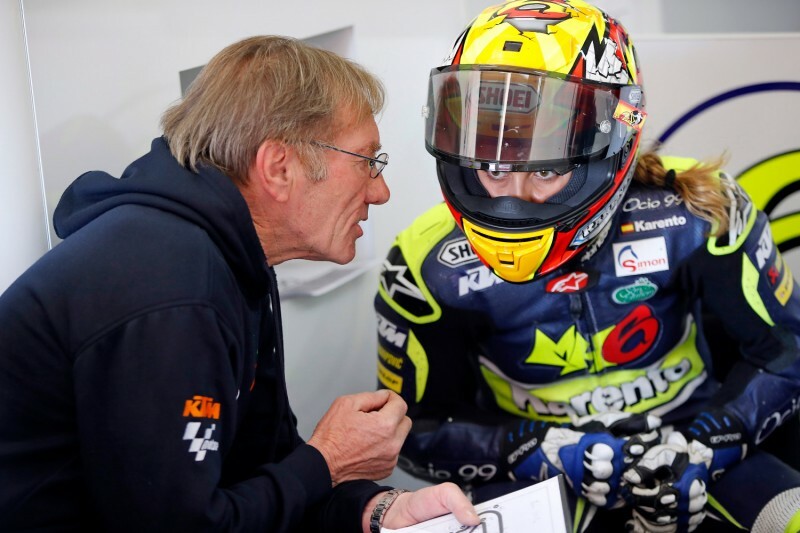 And Aprilia factory rider Álvaro Bautista, who as a young man once flew wildly round the dirt track course on Herrera senior’s premises, also takes Maria to one side to impart a few tips. MotoGP‘s commercial rights holder Dorna is also keeping close tabs on Maria Herrera. 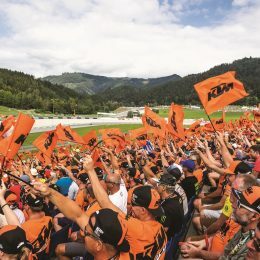 Dorna Communications Director Ignacio Sagnier is keen to stress that he sees no difference between male and female riders, and that everyone is treated the same. That being said, Sagnier knows that almost nothing would raise the profile of Dorna and its Moto3 product more than a woman challenging for victories out on the track. It is against this backdrop that Maria Herrera is pushing her way through the season. Her best qualifying finish has been 22nd on the grid in Assen, her best result was the 14th place finish she recorded the day afterwards in the race proper. In her debut season of 2015, everything went much more smoothly as she racked up some special highlights. Fourth place in the rain at Silverstone – until the fall. 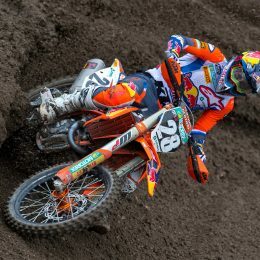 Eighth in Assen – until she was taken out by Niccolò Antonelli. Eighth place in qualifying on Phillip Island, followed by an 11th place finish in the race itself. It is against these performances that she will be measured, but how can she meet such expectations when faced with conditions as challenging as this year? Women and competitive motorcycling has been a sensitive issue since the year dot. Can women even race? For many unreformed chauvinists in motorsport’s corridors of power, the more pertinent question is usually: Should women be allowed to race? There are the anecdotes about Formula 1 boss Bernie Ecclestone, who at one time was also involved in marketing for the motorcycle world championship, telling the Finnish rider Taru Rinne that she wasn’t good enough and made sure that Rinne lost her starting place in the world championship. This is the same Taru Rinne who started in second at the Hockenheim Grand Prix in 1989 and challenged for the victory. 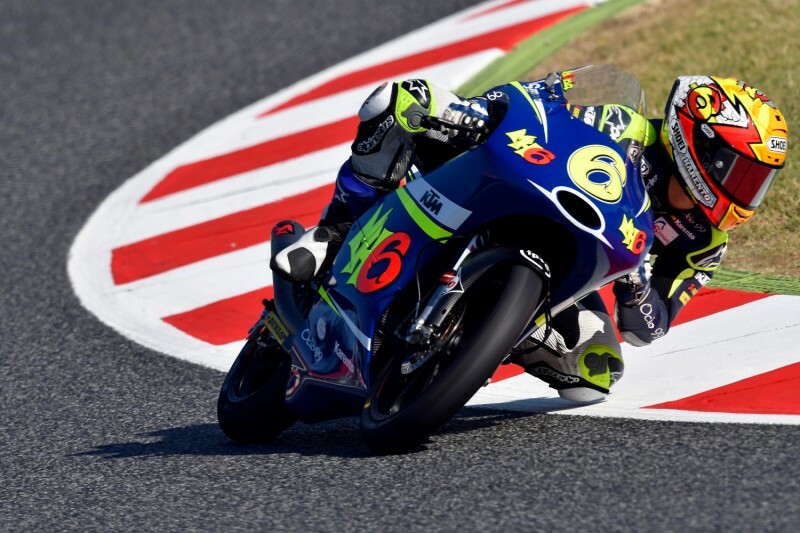 Valentino Rossi, who as the nine-time world champion is the sport’s iconic figure, was quoted many years ago as saying that women would have no place in the motorcycle world championship. He later rowed back on these remarks and explained that what he actually wanted to say was that motorcycle racing would be difficult for women because of the exertions and strength required. In an interview with the German “Welt am Sonntag” newspaper in 2001, Rossi declared that he would retire from the sport immediately if the then 250cc world championship rider Katja Poensgen from Germany recorded a faster time than him on a racing bike. He thought that the ridicule he would attract would be unbearable. And so Maria hits the nail on the head when it comes to the special role of women in competitive motorcycling: How are women meant to liberate themselves if they just race against each other in their own women’s category? 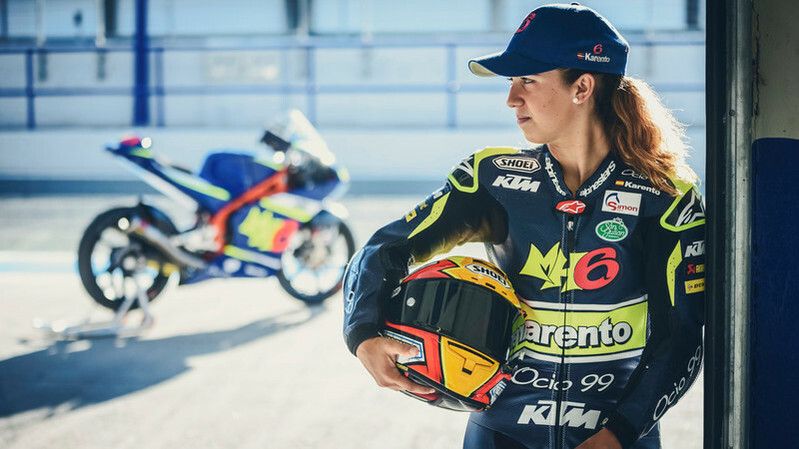 After Carrasco’s exit Maria is the only woman left in MotoGP. Alone among men: An issue for the media, but not for Maria. Dad just needs to find sponsors, Sergio needs to find the right setup, and then Maria can get back to flying round the track like in previous years. This is all Maria Herrera cares about, whether she’s the only woman out on the track or not. Tell Maria I watch her progress at every Moto3 event with interest. I have met her at Phillip Island although she would not remember me. I have assisted The Pramac, Avintia/Blusens and QMMF Teams for many years when the Moto GP circus comes to Australia. I have known De De for many years, from right back when he was with Luis D’antin. I have 2 Daughter’s that is why I would love to see Maria enjoy success in her Moto3 challenge. If all goes to plan I will be at Phillip Island again this year. I come from the world of aircraft engineering and have been involved with motorcycle racing for many years. I have at hand a lathe, Milling Machine and access to TIG welding. If Maria’s Team would like any assistance during the Phillip Island event I would be only too pleased to help (no charge).